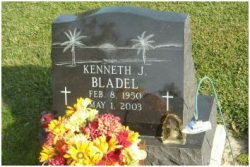 Kenneth J. Bladel, age 53, of Maumee, died Thursday, May 1, 2003 in his home surrounded by his loving family. 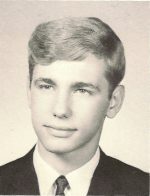 Mr. Bladel was born on February 8, 1950, in Pineville, LA to Joseph and Grace (Bordelon) Bladel. Ken was employed as an industrial engineer at the Jeep Corporation for over 28 years. A veteran in the Army Reserves, his memberships included the Maumee Elks; Indian Hill Boat Club where he was past Commodore, International Order of Blue Gavel and St. Joseph’s Church, Maumee. His hobbies were boating and gardening. He is survived by his loving wife and best friend, Ann (Meyers) Bladel; children, Julie (Dan) Joly, Jeffrey (Stacy) Bladel; Jill Bladel, Jennifer (Adam) Bladel. He will always be cherished by his 8 loving grandchildren. He will be greatly missed by his mother, Grace Bladel; sisters, Janis (Dennis) Wise and Denise (Charles) Turk, many nieces and nephews. His father, Joseph Bladel preceded him in death. Friends may call at the Maison Dardenne Walker Funeral Home 501 Conant St., Maumee on Saturday from 5-9 p.m. and Sunday from 2-9 p.m. Funeral services will be held Monday at 10 a.m. in the funeral home. A Blue Gavel Service will be held Sunday at 7 p.m. in the funeral home. Interment St. Joseph’s Cemetery, Maumee. Memorial contributions may be made to Hospice of Northwest Ohio, 30000 W. River Rd., Perrysburg, OH 43551.